The HQMF XML standard defines the data elements referenced by the logic, and associates them to value sets using object identifiers (OIDs). For those really interested in using the HQMF, you can download the HQMF files for all the Meaningful Use Stage 2 Clinical Quality Measures from the CMS site here. 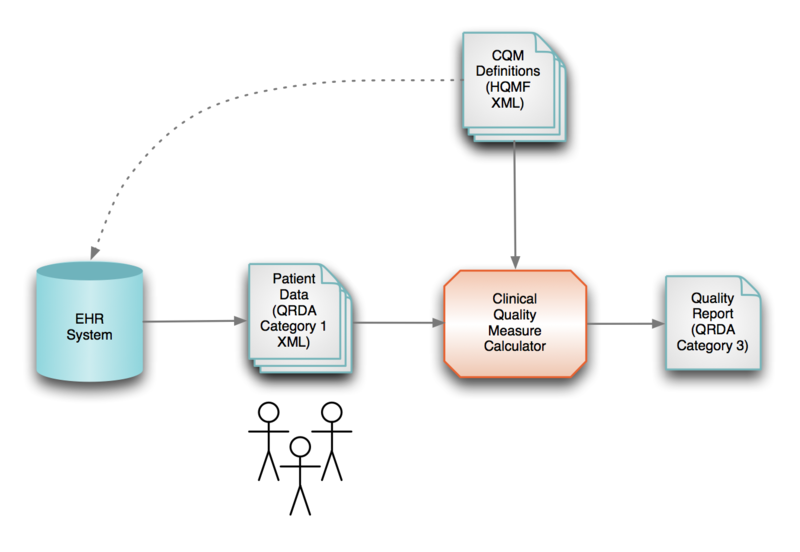 The QRDA Category 1 XML standard is what is used for expressing patient-level data as inputs to a Clinical Quality Measure calculator, such as popHealth, as part of the Meaningful Use Stage 2 program. This XML standard allows for EHRs to express the clinical results of individual patients based on the CQM that an EHR system was queried about. The reports that determine the data to include in the QRDA Category 1 XML are tightly coupled to the HQMF definition of the measure. I have shared high-level information about the QRDA Category 1 specification, as well as an example of what the QRDA Category 1 XML should look like. Lastly, the QRDA Category 3 XML standard is what is used to express the summary results of a CQM. It is unfortunate that the QRDA Category 1 and Category 3 are worded so similarly, yet have significantly different roles in this landscape. The QRDA Category 3 is the artifact that needs to be generated for expressing summary/aggregate report numbers. For instance, if the CQM report where created to assess the mammography screening results of women between the ages of 45 and 65 years old, and the result were 73% of that population met that criteria, the QRDA Category 3 XML could express the 73% performance rate, as well as counts associated with the initial patient population, the denominator, the numerator , the exception, and exclusion populations. You can view an illustration of these different CQM logical families for the proportion-based CQMs here. Below is an illustration that details the use of these various HL7 XML standards when reporting on Meaningful Use Stage 2 Clinical Quality Measures. Hopefully this is helpful. If not, let me know! Is there any significance to the line between the CQM Definitions and the EHR System being dotted? Yes. There's an association between the definition of the CQMs in the HQMF standard that the EHR systems need to track in order to know how to express the details of the patient data in QRDA Category 1 XML. Ie. EHR systems will need to have knowledge, presumably through a parser, of the CQM structure prior to generating the QRDA Category 1 XML data. In the past, when continuity of care XML standards were being considered as the inputs to the CQM logic, the data could be exported in the C32, CCR, CCDA,... without prior knowledge of the CQM that the patients' data was being created for. In the QRDA I document, how do you tell if a specific criteria in the numerator for a specific NQF/CQM matches to which section in the Patient Data template? Hey Rob, thanks for the quick response. When generating a QRDA file for a calculator (like popHealth) to consume, I'm still confused as to how to determine which section to put specific data in. For example, suppose one of the criterias in the numerator of a CQM is that the patient needs to be at least 21 years of age. How do we determine which section/entry in the Patient Data Section to use to house this data? From what I understand, we group the data elements needed for the measures that we list in the QRDA I file in the patient data section for the calculator to consume, however, I am still unclear as to determining the mapping between the data element we are sending and which section/entry to put the data in. Thanks for the article . We are working on using cypress for testing out CQM 2014 . Our counts of numerator denominator etc is matching , but is there any way to make sure what patient cypress included in results ? Also we have looked at quite few document and cant understand "Reporting Stratum" part in QRDA 3 (wiki.hl7.org/images/3/37/QRDA_Category_III_example.docx‎) . What it indicates ? Your article about QRDA 1 has helped us a lot and we will appreciate it if you can explain QRDA 3 as well . Hello George, the Cypress UI provides you with a way to see the specific patients that make the numerator/denominator counts. I haven't been working on that project for about two months, but I am certain that capability exists. If you cannot readily find it, just shot an email to talk@projectcypress.org and the team will tell you how to navigate to that named list of patients. I am not as deep in the QRDA Cat 3 as I am in QRDA Cat 1, so I don't know what reporting stratum means. Again, shot the Cypress talk email list a question to see if that relates to MU Stage 2 certification. I suspect it does not, and that it is not important... however, I strongly suggest you verify with the certification team. The Report Stratum is a part of certification and basically provides an alternate view of the measure broken out by additional groupings. The only examples I have worked with are age based where Weight Assessment (NQF0024) was broken out in total from ages 3-17 and then separately for 3-11 and 12-17. Reporting stratum soley depends on NQFs which selected for your certification, if your NQF is Continues proportion then it will need Reporting Stratum. George, I recently got a >>little<< smarter with the QRDA Category 3 XML. See http://blog.agilehealthservices.com/2013/11/example-qrda-category-3-xml-for.html and let me know if that helps explain more of the QRDA Category 3 details. I need to know more about this kind of news! Thanks for sharing!